Peter Hills has worked the same South Waikato farm for nearly 20 years, but for most of that time, he didn’t own it and he wasn’t paid. He just wanted to help an old man out. He was working in the Police in the late 1990s when they got a phone call from a near neighbour of an elderly farmer, Harold Telford, saying the old man hadn’t been seen for some time. Fearing the worst, Peter visited the farm, found Harold alive and in reasonable health, but could immediately see the old man needed help. At the time, Peter had no idea that he would end up owning the farm near Putaruru. He simply felt that Harold, who had fought in the Second World War and farmed the land ever since, deserved a hand. And having been brought up on a farm himself, Peter enjoyed the physical work as a change from the stress of his Police job and was happy to work unpaid on his days off. “I’m a strong believer that if you can’t do something for somebody for nothing, you might as well not be here,” he says. Peter helped out on the farm for more than 15 years, till Harold died in 2014. By then he was so attached to the place that he bought the land from the old man’s estate. Peter and his partner Shelly have a wide variety of activities to make the farm pay its way. They buy new calves and raise them, run sheep and a handful of beef cattle, graze dairy and beef cows for other farmers and plant maize as a cash crop. Both of them also work off-farm, Shelly as a paramedic, Peter as a milk tanker driver, so both of them are always busy. But despite that, Peter has recently found time to pursue a long-held dream. He has written a dozen children’s books about Kiwi rural life, aimed at encouraging reluctant readers to improve their skills. “Everyone tells me that traditionally boys from the age of seven years old are reluctant readers,” he says. “Not because they can’t read, but simply because there’s nothing out there that actually interests them. The books in the “Me and Dad” series are short and heavily illustrated. Around 600 words are spread over 12 pages, with titles like “Me and Dad Build the Chook House” and “Me and Mum Buy the Pony”. 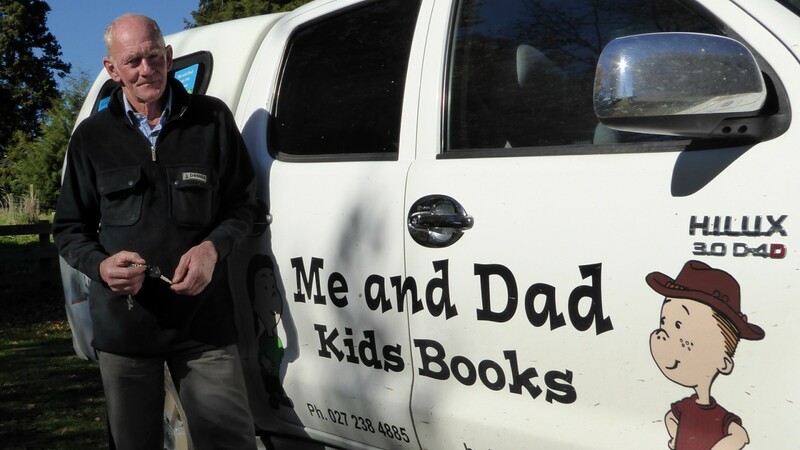 Peter and Shelly have been selling the books online and at rural field days and they say demand is growing as people discover their impact on young readers. “I’m really quite proud of what he’s achieved,” Shelly says.